If you are planning for a home-cooked dinner for your reunion, I am sure you have already started making plans. By now, you should be clearing your fridge & freezer to free up storage space. Some dried goods can be bought way in advance. If you have not bought your meats and seafood, expect to pay premium prices. And yes, go real early in the morning to your fav wet market. Each family has a different heritage and tradition and some dishes will be repeated every year. This year, we are regathering at my childhood home in Petaling Jaya. It is a place of many memories. It is also a place which testifies of God's grace as He has indeed blessed us over the years. I had some dark childhood memories of this place as for one long period, it was being used as a gambling den. I can recall a police raid once and a stranger rushing in and hiding under my bed. All these are long gone as God's light has shone into my home ever since. 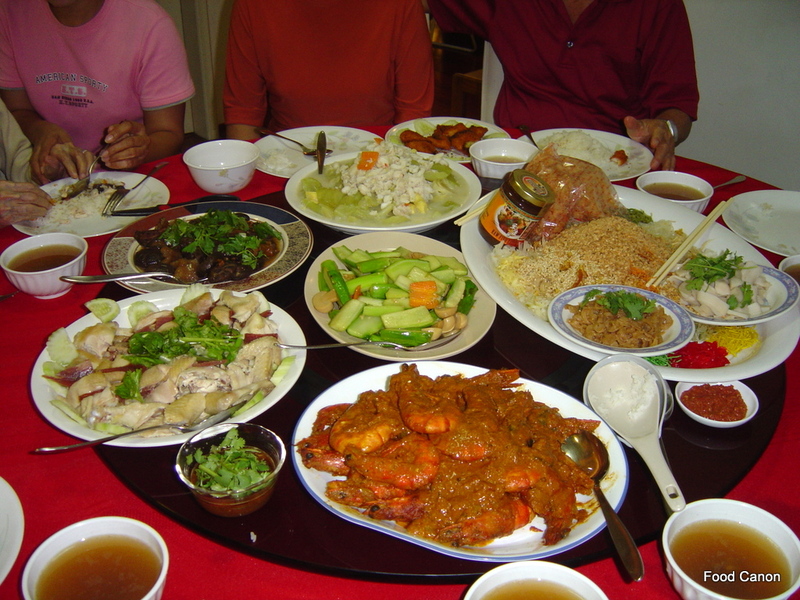 I will give an account of some of the planning going into what we should put on the table when the Wong family gathers. Since my Mum (Auntie Ruby) passed away, the responsibility of cooking fell on a few of us. Over these few years, the tradition continues to evolve and our reunion dishes have certainly improved and getting more "Auntie Ruby-like", even as we also come out with new dishes. I will let you in on what we are planning to do for the Wong table and hope that in some way, it may inspire yours. There will be only a few photos here. The lo han chai (mixed veg) is one of the standard dishes which must be on the table. If we are having the dinner in Singapore, I will cook it and if not, my sister in law Coreen will do it. Sometimes we just collaborate together. In earlier years, this dish is a must because some will go vegetarian during CNY. In recent years, it is a must because we simply love it and cannot imagine a reunion dinner without it. There are many versions out there of course, but ours will be this.We use long cabbage (longbok). Sometimes we add round cabbage as it is sweeter though most prefer the texture of long cabbage. If we want to do a soupy version, stock is a must but normal chicken or vegetable stock will do. Our version uses Fu Yee - white or yellow fermented bean curd. Some prefer the stronger tasting Nam Yee. Then there is the usual dried Chinese mushrooms, kam chan, dried seaweed, vermicelli (dong fun), grated carrots and fried tofu squares.This dish is best eaten with sambal belachan and rice of course. This is a 'Treasures" version I did a few years back. Next up are the 'treasures', such as abalone, dried oyster, dried scallops (the larger ones) etc. By now, you may have ordered pen cai from one of the supermarts or restaurants. If you want to make it for yourself, it is not difficult either. First, you need to make superior stock from chicken, lean pork meat and Jin Hua ham. This stock you can make in advance and fridge it. Next you steam the cooked abalone (they come in cans), dried scallops and clams separately. Cooked abalone and pacific clams will only need a short time in the steamer. Dried scallops will need longer time. Steamed these in the superior stock. The stock gets richer as you gather them and finally thicken it to make pen cai, which to me is just laying out the various components on a deep plate or claypot. You can bed the dish with cooked fresh bamboo. Not quite pen cai actually but as our reunion dinner is not going for a one pot meal, we traditionally prefer to have an array of separate dishes. But this will be how we prepare the treasures dish. Another favourite is a plate of 'waxed' or cured meat. A plate of sliced pork sausage, liver sausage and waxed duck is always inviting. You can just steam it, though some prefer their sausages boiled or steamed, and then fried. One year we were not able to buy River Prawns. Large River Prawns is a must, though these days, the sweeter wild ones are hard to come by. It is likely we have to be contented with farmed ones. I have blogged the Har Lok recipe here. Next up is roast duck. We don't do this at home but join the queues to buy them from our favourites sources in PJ, such as the one at Paramount Garden. Boiled "white" chicken (pak cham kai) is another favourite. My Mum's version uses Kampung Chicken which is tougher but tastier. She will prepare the right sauces to go with it. It fits the other array of dishes better than a Singaporean version of Hainanese chicken, which for me, is better as a stand alone dish and eaten in other occasions. Diced veg with cashew nuts is another longtime Auntie Ruby favourite. Diced capsicum (green pepper), young corns, green peas, carrots fried in soy sauce and some oyster sauce makes up this simple dish. It complements the other dishes very well. For our coming dinner, I may do a variation using macadamia nuts. Either fits a chopstick and bowl dinner well. Yeap, I forgot to mention that we always use chopsticks for our reunion dinners. Another favourite is fried turnip with dried cuttlefish. Complemented with coriander leaves and fresh lettuce, this was a regular feature when my Mum was around. Occasionally, my Mum will make a pork dish such as the braised pork knuckles. I think this dish is too rich given the reunion spread. I normally prefer to do her braised pork rib with water chestnut and Chinese flower mushrooms. These are just some of the dishes we may cook as the spread is still being finalised. There are few photos here but you can expect many in the next post. My cooking experience has improved considerably these last two years and combined with my sis-in-law, we hope for a good spread this coming Sunday. I hope this simple article inspires you as you plan your own.The Reunion dinner does not need to have expensive dishes. Just the ones your family will enjoy and express the tradition in your family. Some Nyonya ones will cook curry chicken. Actually my Mum has Nyonya roots and we make curry chicken from the first day onwards. Happy planning and do have a wonderful meal with your family. Excellent recipes for this new year! Will attempt some of them myself!